Stone wall by Matt Sevigny from Old World Stone & Garden. Completed in 1999, this picture was taken 12 years later. Contemporary stone wall in West Tisbury, Martha’s Vineyard by Jeffrey Bale. Dry stone wall, Ireland. Local residents are encouraged to erect and maintain stone walls. There are hundreds of thousands of miles of dry stone walls in Great Britain and Ireland, some date back to 3,500 BC. © Paul McIlroy. These owners used dry stacking to create a retaining wall with traditional style. Dry stone wall in Ireland. Due to centuries of farming and lifting rocks from the soil just about every boundary in Ireland has a stone wall. Stone wall, Kellyburn Park, Dollar, UK. This type of vertical capstone is typical in Ireland. By stoneinspired.com. Dry stone wall surrounds a replica of a traditional blackhouse built by the DSWAC in Ontario, Canada. If you build a wide, double stone wall, you can fill the top with a little bit of soil for shallow rooted plants. If you let roots go deep into a wall, those roots will destroy the wall. More about this property can be found on Thinking With My Hands. Stone wall in California by Jeffrey Bale. The swirling designs compliment the variations in the wall. Stone wall, 80 feet long x 4 feet high, British Columbia, Canada. This stunning masterpiece is one of many by Ancient Art Of Stone. Must be nice and warm here on a sunny afternoon. A design by Ancient Art Of Stone in Canada, the wave pattern brings the wall to life. The bright color of these stones add vibrancy to the garden. Stone wall by Lew French. The adaption of small columns into the design gives the wall a fence-like structure. Large rock wall by Lew French. The large boulders draw attention to the intricacy of the walls design. Detail of a rock wall shower surround. By Lew French. Rock and shingle wall. Door opens to a garden. Lew French has a new book forthcoming. His first book, Stone by Design can be purchased on Amazon. Slate wall by Andy Goldsworthy. The contrast in the flow of the rocks causes the circle to be distinct. Slate and rock wall by Andy Goldsworthy. The larger stones in this wall give the garden a rustic style. Wall by Andy Goldsworthy in Bedford, NY. A vertically laid wall holds up an enormous boulder. Stone River, 2001 by Andy Goldsworthy. The wall is discussed in an article by the Cantor Arts Center at Stanford University, California. Storm King Wall in Mountainville, New York built in 1997. A 2,278 foot snaking wall plunges into a pond but reemerges on the other side. Dry stone wallflower. Using alternating layers of slate to create the petals and detail in the leaf. Wave Wall in Aptos California by Michael Eckerman. There must be some mortar behind there. River rock wall. Santa Cruz Mountains. By Michael Eckerman. These designers were creative, adding a place for their audio system. Dry stone wall with tree built by Eric Landman in memeory of his wife Kerry. Kerry Landman Memorial, Island Lake Conservation Area, Mono, Ontario. The main wall is Limestone with local rounded granite fieldstones that were found on site to represent the leaves. A lot of them had green moss on them that added to the effect of the stones looking like foliage. The Inca were masterful stone wallers. The fittings are so tight that a knife cannot penetrate the cracks between the stones. Dry stone wall with moongate. Built by Carl Wright in his Garden at Caher Bridge, Co Clare. The wall gently slopes toward the hill, preventing the wall from collapsing. Stone raised bed. This garden bed is part of a farm in New Hampshire. Incorporate a face, by Jerry Boyle. He likes adding faces because they give dimension to the design. A slightly different type of slab was used as the capstone in this retaining wall. 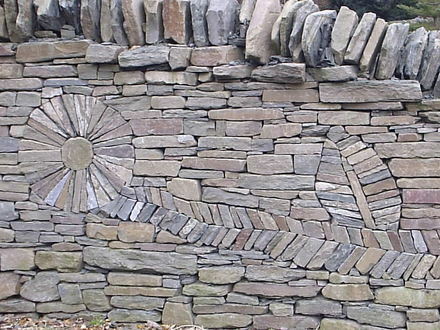 Dry stone wall in dandelion design by George Weaver. This is one of many designs exhibited on the wallswithoutmortar.blogspot.com website. Fantastic collection of stone wall photos. Enjoyed it! This is amazing one day i will have a change to buid when God give to me my own House..
We have a 135 pound tortoise and he has destroyed our backyard. So I thought we could enclose an area with a stone wall too tall for Nelson, the tortoise and plant lovely flowers there in. Good idea? We live next to a usually dry stream bed (California drought) with lots and lots of stones. I am an old lady (78) and my husband is an old man (85). Any suggestions you might be willing to offer would be greatly appreciated. love walls and building them been doing for years nice walls here!